Looking for the quality and cheap window blinds in the Stockport that perfectly blends into any home design and décor, then browse our wide array of window blinds. Explore and choose from our huge collection of vertical blinds, roller blinds, vision and Venetian blinds, conservatory blinds, Velux and much more. All our window blinds are made of the finest quality material and comply with the new regulations. So, all our products are durable, child safe, easy to operate and manage. They easy to clean so they work well even in the kitchen, kid’s room or in commercial premises. With hundreds of colors, designs, patterns, texture and finishing options, you can personalize your blinds according to your taste. We provide you a custom made to measure blinds that can fit any window while enhancing the look of your home. Having significant experience of years in the blinds and shade industry, we’re successfully fulfilling the demand of our valued clients by providing them cheap window blinds in Stockport and all over the UK. This is why we have hundreds of happy and satisfied customers in Stockport and throughout UK. 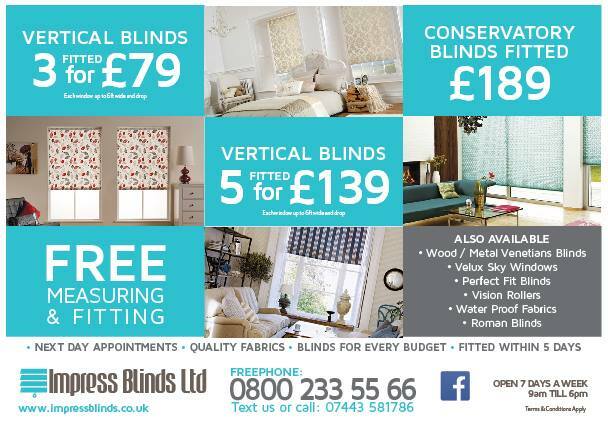 Along with delivering quality products, Impress Blinds also offer professional and free of cost measuring and fitting services to its clients in Stockport and around UK. Our partners and advisors will help you in choosing the right window blind for your home and partner will ensure the fast delivery of your order. We Impress Blinds always deal with quality products and services. That is why we have hundreds of satisfied clients not only in Stockport but all over in UK. 3 roller blinds for £119 with 12 months guarantee. Our major clients in Pontefract (West Yorkshire) are much satisfied with our services.